"Hot springs" redirects here. For other uses, see Hot Springs (disambiguation). A hot spring is a spring produced by the emergence of geothermally heated groundwater that rises from the Earth's crust. While some of these springs contain water that is a safe temperature for bathing, others are so hot that immersion can result in injury or death. a spring whose hot water is brought to the surface (synonymous with a thermal spring). The water temperature of the spring is usually 8.3 °C (15 °F) or more above the mean air temperature. a spring with water above the core human body temperature – 36.7 °C (98 °F). a spring with water above average ambient ground temperature. Much of the heat is created by decay of naturally radioactive elements. An estimated 45 to 90 percent of the heat escaping from the Earth originates from radioactive decay of elements mainly located in the mantle. The major heat-producing isotopes in the Earth are potassium-40, uranium-238, uranium-235, and thorium-232. Water issuing from a hot spring is heated geothermally, that is, with heat produced from the Earth's mantle. In general, the temperature of rocks within the earth increases with depth. 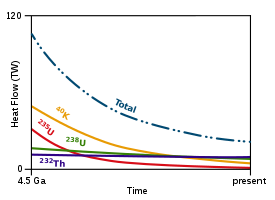 The rate of temperature increase with depth is known as the geothermal gradient. If water percolates deeply enough into the crust, it will be heated as it comes into contact with hot rocks. The water from hot springs in non-volcanic areas is heated in this manner. Note that hot springs in volcanic areas are often at or near the boiling point. People have been seriously scalded and even killed by accidentally or intentionally entering these springs. Warm springs are sometimes the result of hot and cold springs mixing. They may occur within a volcanic area or outside of one. One example of a non-volcanic warm spring is Warm Springs, Georgia (frequented for its therapeutic effects by paraplegic U.S. President Franklin D. Roosevelt, who built the Little White House there). 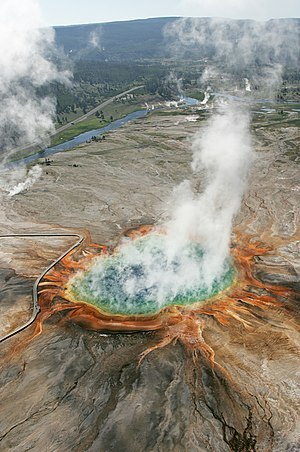 The Excelsior Geyser Crater in Yellowstone National Park yields about 4,000 U.S. gal/min (0.25 m3/s). Evans Plunge in Hot Springs, South Dakota has a flow rate of 5,000 U.S. gal/min (0.32 m3/s) of 87 °F (31 °C) spring water. The Plunge, built in 1890, is the world's largest natural warm water indoor swimming pool. The combined flow of the 47 hot springs in Hot Springs, Arkansas is 35 L/s (1.2 cu ft/s). Elizabeth Springs in western Queensland, Australia might have had a flow of 158 liters/second in the late 19th century, but now has a flow of about 5 liters/second. Ōita Prefecture has 4,762 hot springs, with a total flow of 4,437 liters/second, so the average hot spring flow is 0.93 liters/second. The highest flow rate hot spring in Japan is the Tamagawa Hot Spring in Akita Prefecture, which has a flow rate of 150 liters/second. The Tamagawa Hot Spring feeds a 3 m (9.8 ft) wide stream with a temperature of 98 °C (208 °F). There are at least three hot springs in the Nage region 8 km (5.0 mi) south west of Bajawa in Indonesia that collectively produce more than 453.6 liters/second. There are another three large hot springs (Mengeruda, Wae Bana and Piga) 18 km (11 mi) north east of Bajawa, Indonesia that together produce more than 450 liters/second of hot water. The Dalhousie Springs complex in Australia had a peak total flow of more than 23,000 liters/second in 1915, giving the average spring in the complex an output of more than 325 liters/second. This has been reduced now to a peak total flow of 17,370 liters/second so the average spring has a peak output of about 250 liters/second. In Yukon’s Boreal Forest, 25 minutes north-west of Whitehorse in northern Canada, Takhini Hot Springs flows out of the Earth’s interior at 385 L/min (85 imp gal/min; 102 US gal/min) and 47 °C (118 °F) year-round. Because heated water can hold more dissolved solids than cold water, warm and especially hot springs often have very high mineral content, containing everything from simple calcium to lithium, and even radium. Because of both the folklore and the claimed medical value some of these springs have, they are often popular tourist destinations, and locations for rehabilitation clinics for those with disabilities. 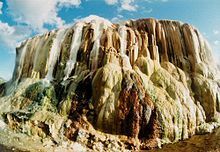 A thermophile is an organism — a type of extremophile — that thrives at high temperatures, between 45 and 80 °C (113 and 176 °F). 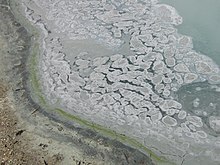 Thermophiles are found in hot springs, as well as deep sea hydrothermal vents and decaying plant matter such as peat bogs and compost. Naegleria fowleri, an amoeba, live in warm waters and soils worldwide and may cause meningitis. Several deaths have been attributed to this amoeba, which enters the brain through the nasal passages. Viruses have been collected from very extreme environments, for example, a hot spring with a temperature of 87 to 93 °C (189 to 199 °F) and an incredibly acidic pH of 1.5 in Pozzuoli, Italy. These viruses were observed to infect cells in the laboratory. The springs in Europe with the highest temperatures are located in France, in a small village named Chaudes-Aigues. Located at the heart of the French volcanic region Auvergne, the thirty natural hot springs of Chaudes-Aigues have temperatures ranging from 45° C (113° F) to more than 80° C (176° F). The hottest one, the "Source du Par", has a temperature of 82° C (179.6° F). The hot waters running under the village have provided heat for the houses and for the church since the 14th Century. Chaudes-Aigues (Cantal, France) is a spa town known since the Roman Empire for the treatment of rheumatism. One of the highly potential geothermal energy reservoirs in India is the Tattapani thermal springs of Madhya Pradesh. The customs and practices observed differ depending on the hot spring. It is common practice that bathers should wash before entering the water so as not to contaminate the water (with/without soap). In many countries, like Japan, it is required to enter the hot spring with no clothes on, including swimwear. Typically in these circumstances, there are different facilities or times for men and women. In some countries, if it is a public hot spring, swimwear is required. Wikimedia Commons has media related to Hot springs. Wikivoyage has a travel guide for Hot springs. ^ "MSN Encarta definition of hot spring". Archived from the original on 2009-11-01. ^ Don L. Leet (1982). Physical Geology (6th ed.). Englewood Cliffs, NJ: Prentice-Hall. ISBN 978-0-13-669706-0. A thermal spring is defined as a spring that brings warm or hot water to the surface. Leet states that there are two types of thermal springs; hot springs and warm springs. ^ "Water Words Glossary - Hot Spring". NALMS. 2007. Archived from the original on January 14, 2008. Retrieved 2008-04-04. ^ a b Allan Pentecost; B. Jones; R.W. Renaut (2003). "What is a hot spring?". Can. J. Earth Sci. 40 (11): 1443–6. Bibcode:2003CaJES..40.1443P. doi:10.1139/e03-083. Archived from the original on 2007-03-11. provides a critical discussion of the definition of a hot spring. ^ John W. Lund; James C. Witcher (December 2002). "Truth or Consequences, New Mexico- A Spa City" (PDF). GHC Bulletin. 23 (4). ^ W. F. Ponder (2002). "Desert Springs of Great Australian Arterial Basin". Conference Proceedings. Spring-fed Wetlands: Important Scientific and Cultural Resources of the Intermountain Region. Archived from the original on 2008-10-06. Retrieved 2013-04-06. ^ Madigan MT, Martino JM (2006). Brock Biology of Microorganisms (11th ed.). Pearson. p. 136. ISBN 978-0-13-196893-6. ^ Shinji Izumiyama; Kenji Yagita; Reiko Furushima-Shimogawara; Tokiko Asakura; Tatsuya Karasudani; Takuro Endo (July 2003). "Occurrence and Distribution of Naegleria Species in Thermal Waters in Japan". J Eukaryot Microbiol. 50: 514–5. doi:10.1111/j.1550-7408.2003.tb00614.x. PMID 14736147. ^ Yasuo Sugita; Teruhiko Fujii; Itsurou Hayashi; Takachika Aoki; Toshirou Yokoyama; Minoru Morimatsu; Toshihide Fukuma; Yoshiaki Takamiya (May 1999). "Primary amebic meningoencephalitis due to Naegleria fowleri: An autopsy case in Japan". Pathology International. 49 (5): 468–70. doi:10.1046/j.1440-1827.1999.00893.x. PMID 10417693. ^ Miyamoto H, Jitsurong S, Shiota R, Maruta K, Yoshida S, Yabuuchi E (1997). "Molecular determination of infection source of a sporadic Legionella pneumonia case associated with a hot spring bath". Microbiol. Immunol. 41 (3): 197–202. doi:10.1111/j.1348-0421.1997.tb01190.x. PMID 9130230. ^ Eiko Yabauuchi; Kunio Agata (2004). 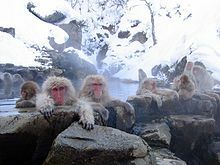 "An outbreak of legionellosis in a new facility of hot spring Bath in Hiuga City". Kansenshogaku Zasshi. 78 (2): 90–8. ISSN 0387-5911. PMID 15103899. ^ Häring M, Rachel R, Peng X, Garrett RA, Prangishvili D (August 2005). "Viral diversity in hot springs of Pozzuoli, Italy, and characterization of a unique archaeal virus, Acidianus bottle-shaped virus, from a new family, the Ampullaviridae". J. Virol. 79 (15): 9904–11. doi:10.1128/JVI.79.15.9904-9911.2005. PMC 1181580. PMID 16014951. ^ Ravi Shanker; J.L. Thussu; J.M. Prasad (1987). "Geothermal studies at Tattapani hot spring area, Sarguja district, central India". Geothermics. 16 (1): 61–76. doi:10.1016/0375-6505(87)90079-4. ^ D. Chandrasekharam; M.C. Antu (August 1995). "Geochemistry of Tattapani thermal springs, Himachal Pradesh, India—field and experimental investigations". Geothermics. 24 (4): 553–9. doi:10.1016/0375-6505(95)00005-B. ^ Fahr-Becker, Gabriele (2001). Ryokan. p. 24. ISBN 978-3-8290-4829-3. Marjorie Gersh-Young (2011). Hot Springs and Hot Pools of the Southwest: Jayson Loam's Original Guide. Aqua Thermal Access. ISBN 978-1-890880-07-1. Marjorie Gersh-Young (2008). Hot Springs & Hot Pools Of The Northwest. Aqua Thermal Access. ISBN 978-1-890880-08-8. G. J Woodsworth (1999). Hot springs of Western Canada: a complete guide. West Vancouver: Gordon Soules. ISBN 978-0-919574-03-8. "Geothermal Resources of the Great Artesian Basin, Australia" (PDF). GHC Bulletin. 23 (2). June 2002.